Lions are a different species at night. During the day, they must remain hidden from their prey. But there is nothing secretive about a lion’s behavior on a moonless night. There is no skulking, no need to hide. The lions own the darkness. The Kalahari Bushmen still live the traditional hunter-gatherer lifestyle of our ancestors, and they frequently hunt at night – but only when the moon is above the horizon and bright enough for human eyes to detect shapes and movements. Without the light of the moon, say the Bushmen, the night belongs to the lions. So they divide the night with the lions according to the phase of the moon. And if there is a lunar eclipse? That is just a hungry lion, placing her paw in front of the full moon, stealing a little extra darkness. 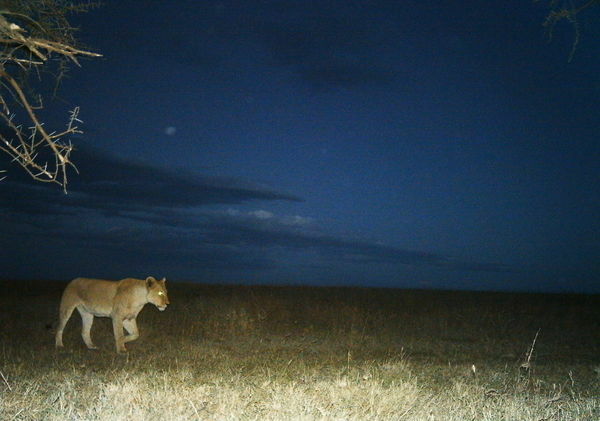 The Serengeti lions don’t feed well on moonlit nights. Lions have fuller bellies around the new moon; they are thinnest at the full moon. To compensate, they scavenge or hunt more during daylight hours. Wild herbivores are available to lions throughout the night, no matter what the moon is doing. However, humans universally stay up until around 10:00 pm or so and sleep until sunrise. If we’re going to be out and about at night, we’re out in the evening not before dawn. By the full moon, the hours after sunset are so bright that you can read a newspaper. But the next night, the moon doesn’t rise until an hour after sunset; by the fourth night, the darkness persists for over three hours before the moon finally rises. Outbreaks of man-eating lions have killed hundreds of people in southern Tanzania over the past twenty years. These are agricultural areas where lions mostly survive on bush pigs – agricultural pests that cause people to sleep in their fields to protect their harvests. Thus pigs provide the link between lions and vulnerable humans. Former graduate students Hadas Kushnir and Dennis Ikanda visited survivors and victims’ families and recorded the precise time and date of 450 attacks on humans. Most occurred between sunset and 10:00 pm, and while the last few nights before the full moon were the safest, the first few nights after the full moon were three-and-a-half times more dangerous. After enduring the bright evenings prior to the full moon, the lions were hungry, and they mostly attacked people upon the return of evening darkness. The full moon can feel spooky, and humans have constructed moon-related myths about werewolves and lunacy and Halloween. But there is no linkage between moon phase and suicide or admission to psychiatric institutions. So what if the full moon doesn’t make you crazy but just makes you nervous? What if it keeps you safely indoors for a couple of nights? The full moon isn’t dangerous in itself, but after a few million years of dividing our nights with lions, it would be surprising if we didn’t somehow sense the monthly dividing line between our time and lion time. Here you can read the original research article about lions and the full moon. That is the first explanation of our fear of the full moon that I’ve heard which makes sense. As a small child I was terrified of the moon when it was gibbous. Must have been something primal in my subconscious. Sixty-odd years later it still makes me nervous.